Preface: For individuals, couples and families looking for a relaxed vacation at the beach away from all the hustle and bustle of city life, an all-inclusive resort in beautiful Nuevo Vallarta is highly recommended. As this itinerary includes a few day trips outside of Nuevo Vallarta, on those days your budget should include enough for some drinks, lunch and possibly a dinner or two outside the resort. DAY 1 – SATURDAY: Arrival day to Nuevo Vallarta. Unpack your suitcase. Walk around and become familiar with your resort’s amenities. Order a frosty Margarita at the bar, and with drink in hand head out to the beach to enjoy lounging by the ocean for a while. Have a nice dinner at your hotel, hopefully out on a terrace or wide patio where you can enjoy the sunset. After dinner take a short leisurely walk along the beach, or put on a swimsuit and head for the Jacuzzi. DAY 2 – SUNDAY: After a delicious buffet breakfast in the dining room, change clothes and head out to the swimming pool area to swim, participate in fun activities run by the resort’s staff, or to just lounge, snooze under an umbrella or read a book. Enjoy all-inclusive drinks all day, as well as both lunch and dinner at your hotel. Check the resort’s activity schedule to see what live entertainment options are available on site that evening and throughout the week. DAY 3 – MONDAY: After breakfast at your resort, take a bus or taxi to Sayulita to enjoy some beach fun at this sweet laid-back town with really great vibes. There are surfboard rentals and lessons available right on the sand, as well as plenty of restaurants and bars on the beach. Additional dining options are within a short walk up from the beachfront. Throughout town to include streets leading directly up to the town square there are a lot of cute little boutiques to browse through and shop. After lunch follow the road that’s directly in front of Villa Amor and the “O” Restaurant heading south. Curve around toward the left and up over the hill through the small cemetery to enjoy the lovely and peaceful Los Muertos Beach. After a full day of beach and sun, return to Nuevo Vallarta to have a dinner at your resort. Afterward take advantage of the opportunity to relax, mingle with other vacationers and possibly make a few new friends at one of the hotel bars or lounges that stays open late. Sip cool drinks and recap the day. DAY 4 – TUESDAY: After a leisurely breakfast in the dining room, take a nice walk down the beach (or depending on the distance from your resort, take a taxi) to the lively Mexican town of Bucerias. 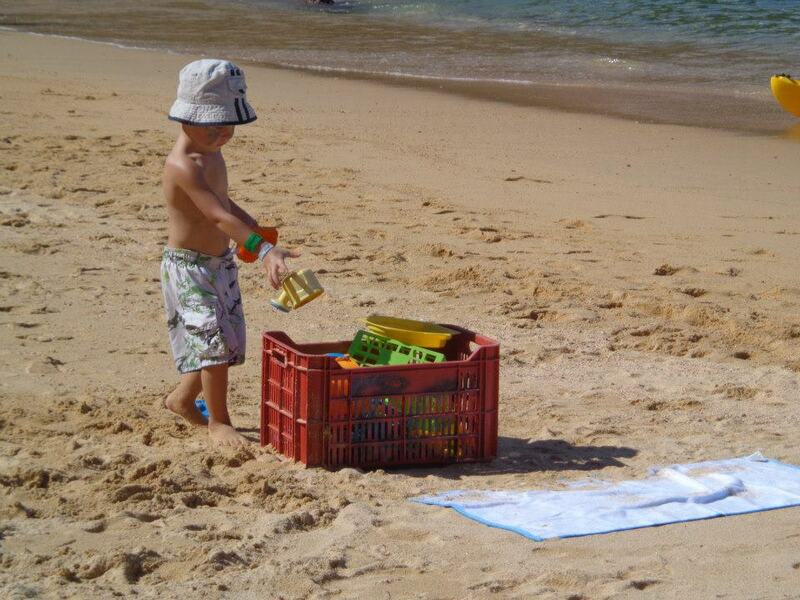 Here you can relax along the beach and enjoy cool drinks and snacks from beachfront bars and eateries. Walk up toward the town square and explore a bit, making sure to stop by the Bucerias Flea Market located along the south end of the town square to shop for souvenirs or to find a beautiful piece of art to take back home. As you walk around town take a peek at some of the menus posted outside restaurants, and choose a nice cool location to enjoy lunch. After eating you can head back down the beach to your Nuevo Vallarta resort and spend the rest of the afternoon relaxing in and around the swimming pool until it’s time to go up to your room to freshen up for dinner. 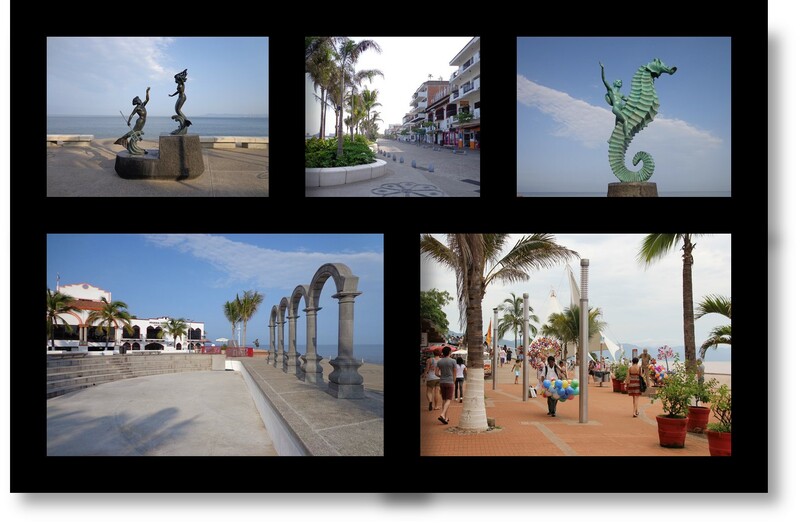 DAY 5 – WEDNESDAY: After enjoying a delicious breakfast, pick up your camera and take the public bus (45-minute commute) or a taxi (25-minute commute) to the city of Puerto Vallarta. 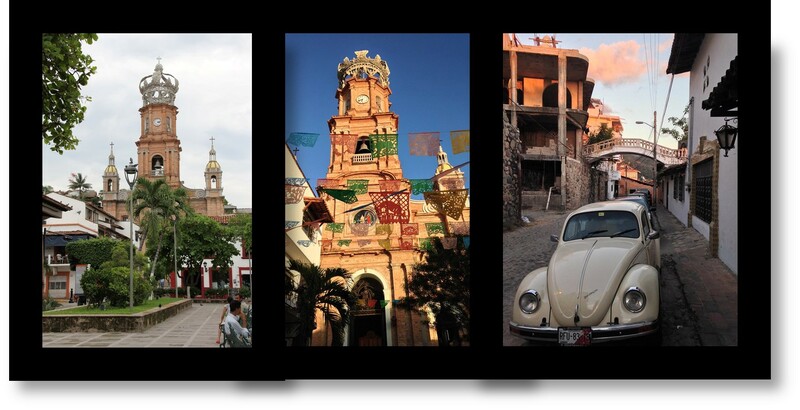 Your destination: El Centro and the world-famous Malecon. Starting at the north end of the Malecon head south enjoy the lovely sights and sounds of this beautiful mile-long boardwalk. Browse the shops. Stop to get a Margarita or an ice cream cone. Slowly make your way down the Malecon to the pedestrian bridge which crosses over the Rio Cuale. 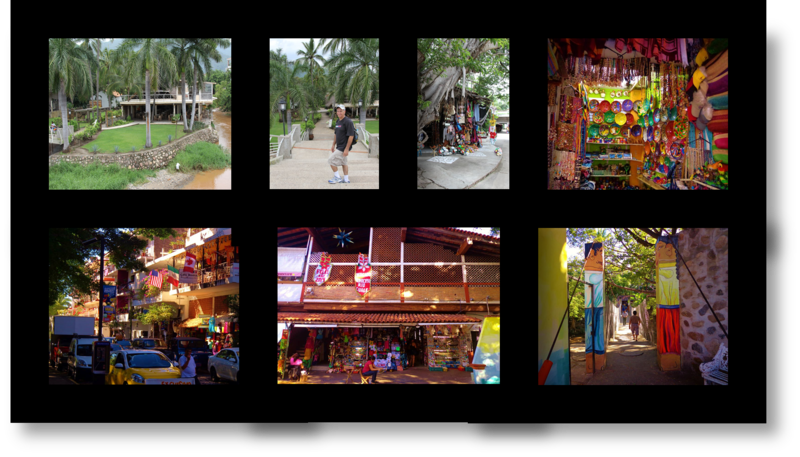 If you happen to see the sign Plaza Malecon, take a bit of time to check out this hidden cove of shops with its variety of colorful treasures. Photos of Malecon leading toward the bridge over the Rio Cuale where there are steps leading down to the tiny island: Isla Rio Cuale. Continuing past the four arches (an iconic symbol of PV) and past the Naval History Museum, soon you will reach the the lovely pedestrian bridge that crosses the Rio Cuale. Take the wide flight of stairs down to the tiny island: Isla Rio Cuale. Walk around the open-air flea market area, and maybe stop by Oscar’s or The River Cafe for a cool beverage. Continue heading east through the flea market, and about half way down the Isla Rio Cuale, you will see stairs leading upward. After climbing the stairs you will be on a sidewalk viewing another set of stairs across the road. Carefully cross busy Insurgentes street and descend another set of stairs to the street Encino. There will be buildings on the left and a wall on the right which borders the Rio Cuale. About a block and a half down, look up for a series of flags and you will see Cafe Roma which offers excellent Margaritas and very tasty chicken sandwiches. After a brief stop at Cafe Roma for Margaritas, continue heading down the block which ends at the two-story Municipal Market (flea market) building that covers an entire city block. As you approach the west entrance to the Municipal Market, on the right hand side there is a cute entrance for a hanging bridge. The planks have been recently replaced and it’s totally safe. If you take the hanging bridge across the Rio Cuale, you will arrive at a continuation of the Rio Cuale’s open-air flea market. Continue walking straight ahead and over to the second hanging bridge. After crossing the second hanging bridge, you will exit onto the street Constitution near a tortilla factory on your left. Walk down Constitution heading south about three blocks and you will see Los Muertos Brewing on the left-hand side, on the corner of Constitution and Lazaro Cardenas. Los Muertos Brewing is an excellent place to stop for lunch. Photo 1: The tiny island “Isla Rio Cuale.” Photo 2: Stairs heading down to Isla Rio Cuale. Photos 3 and 4: Flea market shops. Photo 5: Cafe Roma. Photo 6: Mercado Municipal, the one-block flea market building. Photo 7: The entrance to the hanging bridge. Once on the tiny island there is another bridge on the other side of the island which when crossed leads to the street Constitution. After eating, just continue to walk around and explore the city at will, turning down streets according to your curiosity. All areas of town are safe for tourists. If your self-guided walking tour takes you back to the area of the Main Plaza (town square), you can walk north heading up Zaragoza Street about five blocks to admire Liz Taylor and Richard Burton’s Lover’s Arch, a small pink and white bridge that formerly connected their two PV residences which were directly across the street from one another. This love bridge was modeled after the Bridge of Sigh’s in Venice, Italy. After your in-depth explorations of Puerto Vallarta, you can choose to have dinner along the beach in the Romantic Zone and enjoy the sunset, or if you’re feeling tired you can head back to the resort in Nuevo Vallarta for a late-night seating for dinner. But if you’d like to stay in town after dinner, you can head over to Nacho Daddy on Basilio Badillo for some great live music on the second floor, or enjoy after-dinner drinks and live music at Cuates Y Cuetes, which is located on the beach and just north of the Los Muertos Pier. Photos show the Main Plaza (town square) with the Lady of Guadalupe Church in the background, and a close up of this church with a crown. From the Main Plaza follow Zaragoza Street heading east. This street borders the south side of the church and perpendicular to the beach. About 5 blocks up is Liz Taylor and Richard Burton’s famous Lover’s Arch. DAY 6 – THURSDAY: Today’s leisurely activites are a repeat of Day 2. After a great buffet breakfast at your resort, change clothes and head out to the swimming pools to swim, participate in fun activities run by resort’s staff, or just to lounge, snooze or read a book. 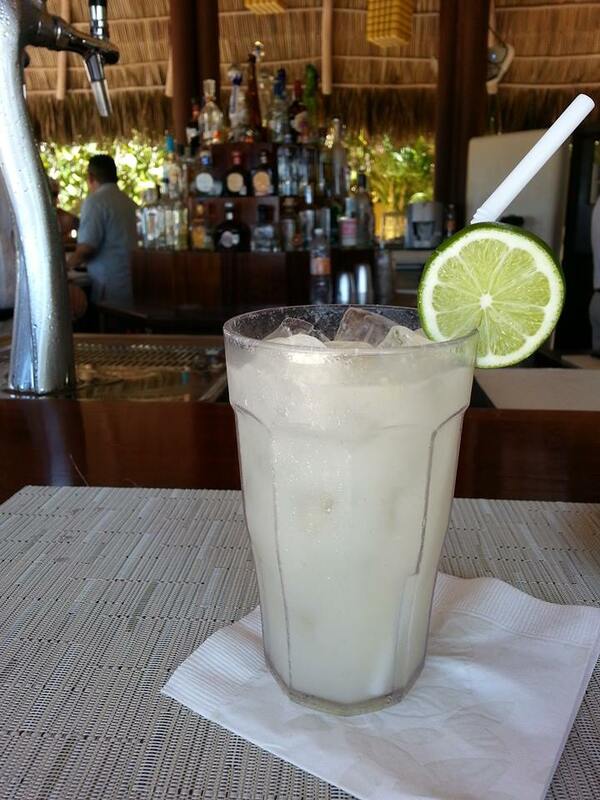 Enjoy all-inclusive drinks all day, as well as both lunch and dinner at your resort. Check the resort’s activity schedule to see what live entertainment options are available at your resort that evening and throughout the week. DAY 7 – FRIDAY: Your final day begins with a buffet breakfast at the resort, followed by a trip back to the room to pack up the suitcases. If there’s enough time, take a quick dip in the pool and then a walk out to the beach with a final Margarita for a quiet sit in the sand. Breathe in the fresh salt air and absorb your surroundings. Today feels a bit melancholy as you will be leaving the leisurely days of beach, ocean and sun behind you and returning home to the daily grind. On the plane home start planning your next trip back to beautiful Banderas Bay.